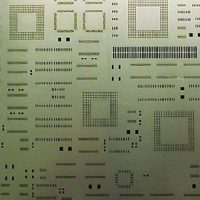 The successful manufacture of electronic printed circuit board assemblies relies on the precise dispensing of solder paste through a stencil. Once the solder paste is deposited, the components are placed onto the paste and the whole assembly is heated to melt the solder. There is one aperture for each pad on the circuit board and small circuit boards are grouped together, meaning each stencil has thousands of apertures to be cut. A redENERGY G4 Pulsed Fiber Laser can be used on a dedicated machine to cut out the individual apertures at high speed. Fiber Lasers can cut less than 15μm wide slots with the correct taper to allow optimal paste release. redENERGY G4 offers high peak power (>20kW), 20μm -200μm pulses at high repetition rates (up to 200kHz), enabling high aspect ratio material removal.